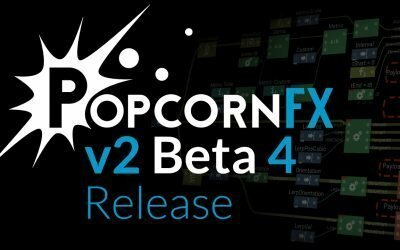 The PopcornFX v2.0.0 release build is now available ! You need to upgrade your existing projects in order to use it. We updated the ‘Tutorials’ and ‘Samples’ online packages. 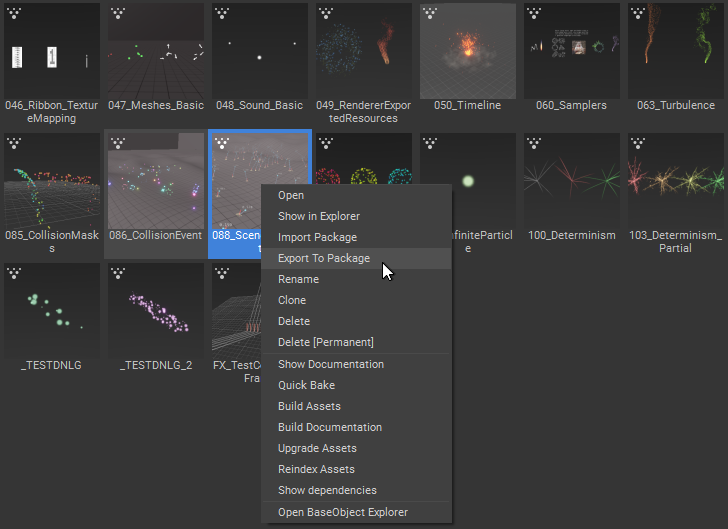 Select the ‘Online Packages’ tab in the project selection window and download the latest ones. 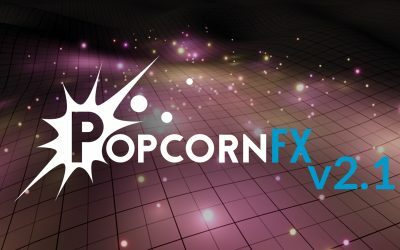 First time using PopcornFX v2.0? Take a look at the Getting_Started wiki page. This is especially useful to customize the ‘SpawnCount’ of multiplied nodes with dynamic values coming from attributes or curve samplers. By default, all nodes and script functions expecting angles are expecting them in degrees instead of radians, and expose an ‘AngleUnit’ property set to ‘Degrees’ by default, which allow you to revert back to the old behavior if you prefer working with radians. Scripts expose new degrees and radians namespaces, and all functions working with angles now exist in those namespaces as well as the default namespace. IMPORTANT: There is still one exception left that we will update in a later build: Billboard renderers still expect their ‘Rotation’ input pin to be given an angle in radians. We started reworking the color picker, there’s still much work to be done on it, but it should already be much more usable than the old one. 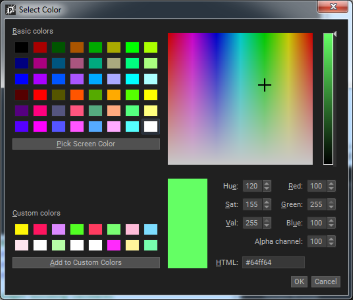 Additionally, you can pop the color picker in the curve editor by selecting a keyframe and hitting the ‘C’ key. 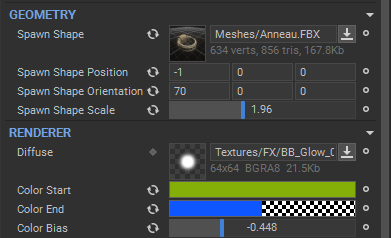 Added a new asset picker widget that shows a preview of texture assets, and details of texture and mesh assets such as resolution, compression format, ondisk size, triangle count, etc..
Compiler now handles real ‘bool’ types (#1144). Can use those inside scripts, and all boolean operations such as compare nodes are now typesafe. IMPORTANT: If you had effects doing integer arithmetic on the result of a compare operation, you will need to patch them by hand to get the same behavior in v2.0.0 as you had in beta-4 and below. 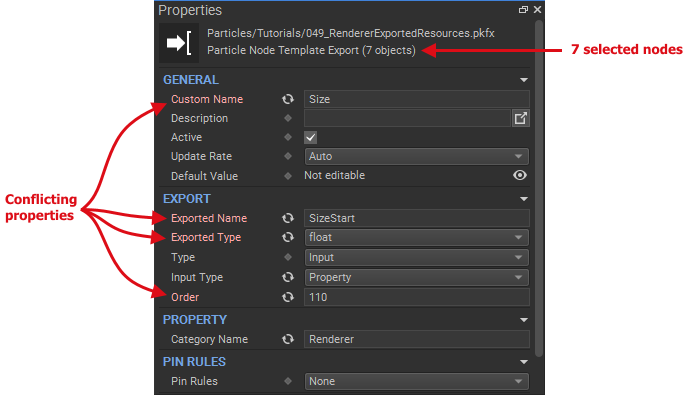 Only properties present in all selected nodes are displayed. Properties that have different values will be highlighted in red for emphasis. Legacy v1 templates were renamed & split into v2 versions. 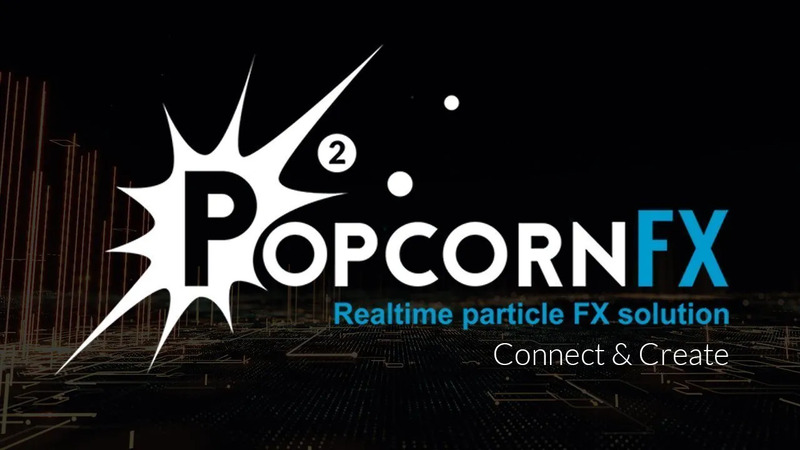 PopcornFX v2 has seen a pretty large number of bugfixes and stabilization fixes. Fixed #2219: Curve editor: Bad tangent input-box behavior. Fixed #2223: Simulation seems to sometimes fallback to default turbulence inside Physics template. Caused by false-positives when merging resources in effect optimization pass. Fixed #2235: Backend: integer ‘sign’ function always returns ‘0’ for positive numbers, instead of returning ‘1’, when given a compile-time constant input value. Fixed #2242: Package import stalls on computers with low processor counts. Fixed #2213: Texture sampler hot reloading doesn’t work with photoshop. Fixed #2221: Timeline Events are only taken into after saving the effect and launching it again. Fixed #2236: GPU sim: ‘sign’ function has different behavior than CPU backend. Fixed #2228: Optimizer: Bad constant-folding function hooked to spatial layer’s ‘closest2’ function, causes incorrect simulation results when the inner-radius of the query is a constant zero. Fixed #2229: Constant folding of null turbulence sampler coming from an unplugged template pin does not work anymore. Fixed #2145: Content browser treeview: Selection tracking glitches. Fixed #2245: Occasional project launcher crash when trying to import package into project. Fixed #2246: Occasional crash when creating link from pin. Fixed #2248: Crash when effect file deleted while opened in effect editor. Re-enabled D3D11 GPU simulation in editor. Fixed #2190: Multiple SetLife nodes running at the same rate will conflict without warning, and behavior will be unpredictable: Now displays a warning. Fixed #2244: Nodal Editor: crash when undoing creation of a node contained in an annotation while moving annotation. Fixed #2315: Curve sampler constant folding asserts and fails when the curve comes from a property. IMPORTANT: previous installers created a “.gitignore” file in your project’s “Library/” folder. This patch fixes the issue (#2343). If you are using git, make sure you delete this .gitignore to avoid problems. 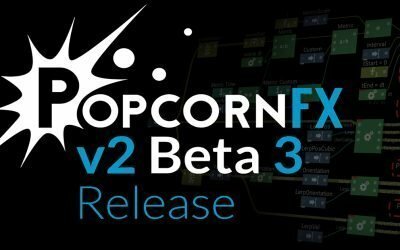 PopcornFX v2 Beta 3 is released!